Burls, roots, and seed pods are the primary materials used by Roger Schultz in creating his turned wood pieces. These materials shipped to him in their natural form from all over the world. The natural forms are then oriented and sized into "blanks" for mounting on the wood lathe. The lathe functions to rotate the wood "blank" on a horizontal axis. Hand held steel tools shape the "blank" into desired form. The forms are then sanded and textured to create various surfaces. The finish used depends upon the wood and form. Finishes may be oil, lacquer, wax, none, or combinations of the same. Each piece is one-of-a-kind and created entirely by the artist's hands. 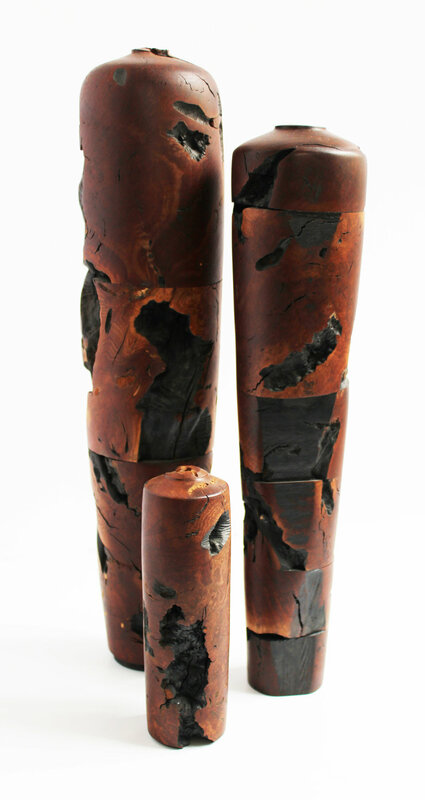 Manzanita wood is a root burl frequently containing rocks that are captured by the roots underground. The irregular shape and various voids make turning the blanks more challenging compared with other woods. In Spanish, Manzanita means "little apple" which is likely a reference to the fruit the tree produces. Manzanita ranges in color from soft reddish peach to a deep reddish maroon and is a common wood in California and Mexico.